Design by Viking Tool & Gage, Inc.
Viking Tool & Gage employs three full-time engineers to help with your product development, tooling design, project management, and process improvements. Our hands on approach, coupled with our personal experience, in our production facility aids in the practical side of engineering. Our specialties include CNC fixturing, progressive stamping dies, and special fully automated equipment. Software utilization includes both 2D (AutoCad) and 3D (Solidworks) while encompassing the capability to import almost any format. 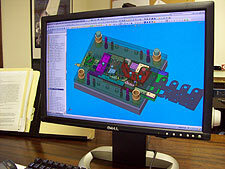 Our CNC programming software (Virtual Gibbs) uses the engineering models for accurate and fast CNC programs.